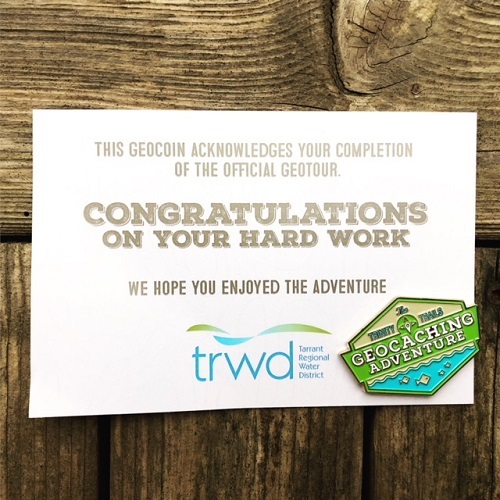 Just wanted to share a photo of the geocoin received for completing the TRWD Trinity Trails Geocaching Adventure GeoTour. It's a trackable coin, one of the more attractive GeoTour coins I've earned. Earning a coin requires finding 25 caches along the Trinity Trails system in the Fort Worth, Texas area. I was able to finish the GeoTour in the equivalent of a full day, but I think two days is more realistic. Especially if you're finding other caches along the way. Do you walk most of the way, along the trail? I'm wondering when you recommend 2 days for 25 caches that it involves a lot of walking. This looks like a fairly new geotour, and I bet its a lot of fun! I'm glad you posted about this since its one of the closest geotours to me! Darn it, I didn't check the "Notify me of replies" button for this thread! Sorry about that. I did walk (or run) to all of the caches. It would have been great to have had a bicycle at my disposal, because a lot of the caches would be nice to bicycle. Your timing is perfect. I'm going next week. I have a great bike rack but the vehicle that supported it died last year. I've got to figure out how to get our bikes out there. I know they rent bikes on the trail but this girl needs her grandma style bike! Well crud. You have to find 25 caches to get the coin, but there are only 26 now and one is disabled. Now you'd have to find all of them!